I have been trying different strings on my guitar off and on for probably about a year. I really liked the Adario strings at first but, still I wanted a little more something. Every guitar is different and handles each set so differently. I have been most happy with the Hannabach Silver Special 815LT. 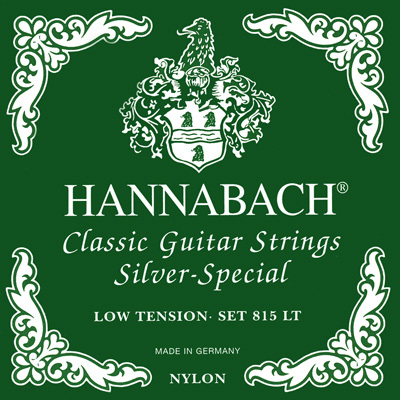 I first tried the Hannabach Silver Special 815 Medium tension and liked those however, I felt my guitar was a little stressed by them. I backed the tension off, and I feel I have found the perfect strings for my guitar. The perfect strings for me are strings that are comfortable for the guitar and ones that are fexible in how they express themselves. They are lively and sustain notes. I disagree with Spyros. I find these to be the best sounding strings on my Jose Ramirez 1A Classical guitars, both spruce and cedar tops. I've tried many different nylon strings over the past 40 years. I'm sold on these. Excellent strings. I'm playing them on a spruce top - wonderful sound very rich and clear. I decided to experiment and try something different than my normal J45 which I have used forever. Wow! These were great. The D string had bad intonation at first, but after I turned it around and reinstalled it, it was fine. I knew this string had a reputation for inconsistent D strings. The trebles on these have a very refined sound and the bases have plenty of punch. I can't lower the ranking for the D string, because many fine strings have some inconsistency. Most serious players just buy a bunch of sets and spare singles anyway, so an occasional bad string is no issue.